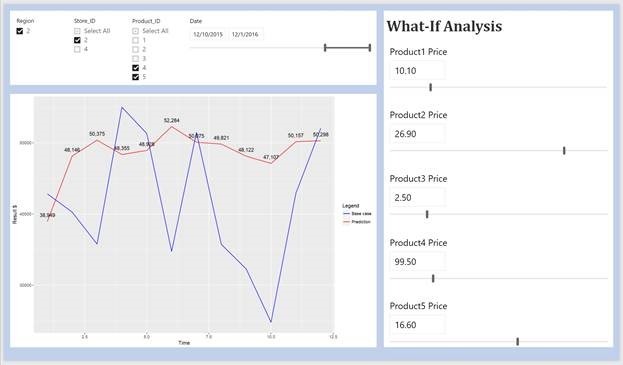 Microsoft Senior Program Manager Christian Berg is back with another entry in his series on becoming your organization's strategic advisor with Machine Learning and Power BI. If you need to catch up, you can find the five previous chapters summarized here on the blog. Visualizing and exploring the results of your Azure Machine Learning Studio (ML Studio) experiments is useful both when developing and evaluating the model but most importantly when deploying your model and presenting the results. 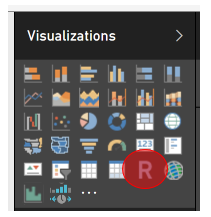 With Power BI Desktop this can be done in two ways, either by writing the results from the model to a database that you then connect Power BI to, or by using an R script visual (Rviz). Using an Rviz has the advantage that you can dynamically select the subset of the Power BI model that you want to score. This enables powerful What-If Analysis scenarios where you can use R and ML Studio to assess the distribution of likely outcomes based on the counterfactuals. 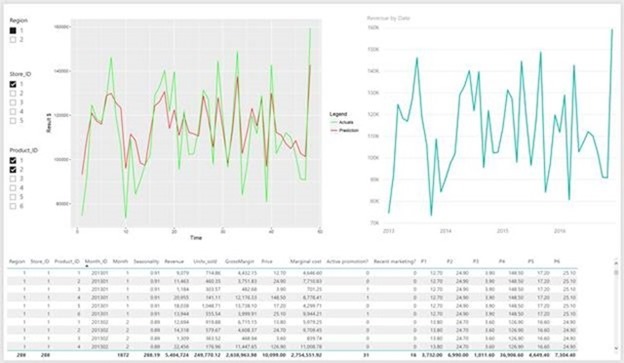 In this example we will look at connecting to an Azure ML Studio experiment with an Rviz and then building on that to create a dynamic report to explore cross price elasticities. 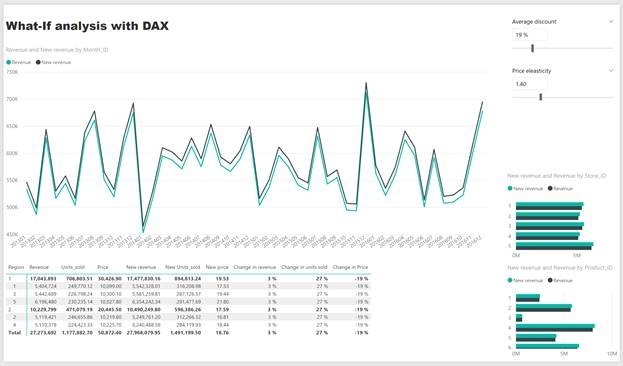 We will also look at a simpler example where we instead use DAX to explore the impact of different discount percentages, based on an assumption about our elasticity. For the example report we have an ensemble regression model that was built in ML Studio to predict revenue by store, product and month using historic data, marketing information and future prices. The timeseries component is pre-calculated from part two. For this report to work in Power BI Desktop you need the packages AzureML and ggplot2 installed. 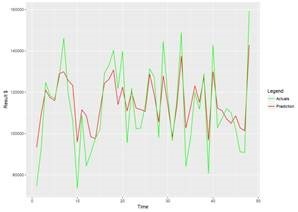 If you have not previously used these packages on your computer, install them by going to your R console in R Studio or other R GUI and copy/paste install.packages("AzureML "), and repeat that for “ggplot2”. If you are new to R, please see my previous post for installation instructions. 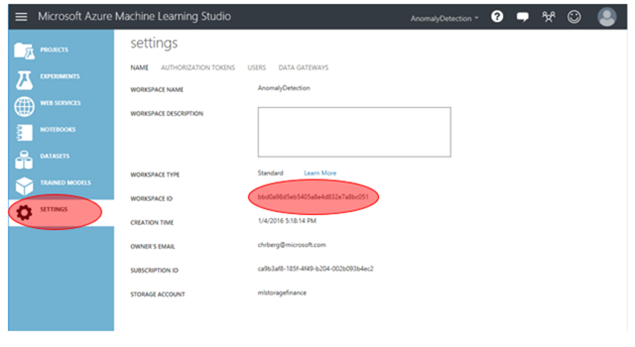 Please note that AzureML uses networking services which are currently blocked in the Power BI service. When you open the example report and go to page 1 (Simple what-if analysis) you will see a line chart showing the historic revenue in the data model and the hypothetical revenue amount, based on the average discount and price elasticity parameters. Below the line chart you will find the breakdown of both amounts in a drillable matrix visualization. In the top right-hand side corner are the two parameters Average discount (applied across all products) and Price elasticity. By changing these two parameters you will see the other visualizations’ measures beginning with “new” updating. While these are straightforward relationships this can be powerful to allow the report’s users to develop an intuitive understanding for the underlying sensitivities. Especially when there is little prior knowledge about the variation in inputs but the relationships between the inputs and relevant KPIs are well understood and modeled. 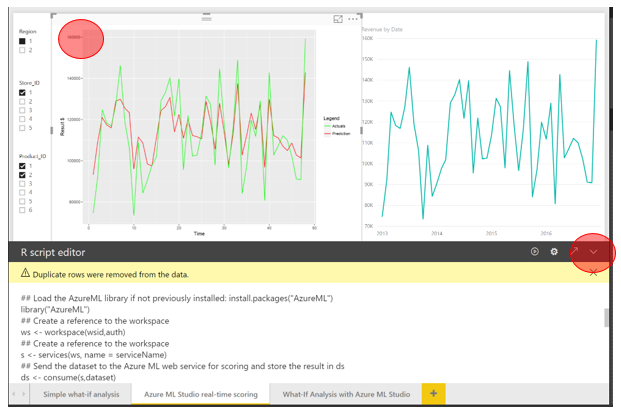 On the second page, Azure ML Studio real-time scoring, we are not inputting any assumptions but instead using slicers and Power BI’s filter functions to dynamically select a subset of the data model to be sent to our Predictive ML Studio experiment. The three slicers are followed by the Rviz which plots the actual revenue and the model’s predicted value. To the right of it is a normal line chart showing the historical values only. Unlike the previous page where we had to estimate elasticity this model was trained on all available data and uses the price points of the six products (P1-P6) to predict what the revenue would be. However, we are limited to only using real data for the scoring. On the third page (What-If Analysis with Azure ML Studio) we have combined the previous two pages using both input parameters and real-time scoring. This allows us to test different price points per product with the Azure ML experiment. Just as on the previous page there is no need to estimate elasticity since the model has learnt this relationship through the historic data and by adding parameters for marketing campaigns etc. we can now assess the probable range of any scenario of interest. To create a scenario, start by selecting the regions, stores and products that you are interested in using the corresponding slicers. Then select the time interval that you are interested in (this could have been exclusively or partially future dates). By changing the planned price on the different products, you can then examine which combination has the highest expected revenue or profit. This model takes cross-price elasticities into account, i.e. if one product is a complement or supplement to another product a change in its price will also affect units sold for the other product. In summary, a powerful tool to quickly compare the average Azure ML Studio prediction of the impact of your scenario against the base case. 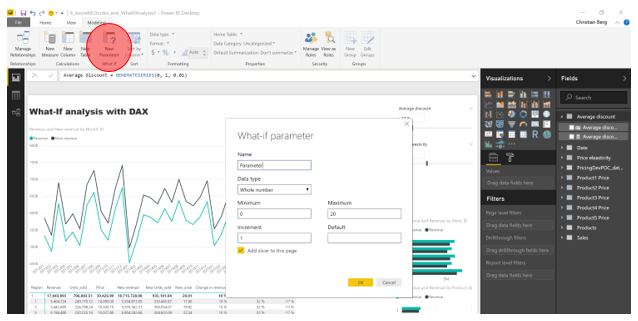 To build what-if like dynamic reports in Power BI start by creating the parameters that the user should be able to input by clicking Modelling -> New Parameter in Power BI Desktop top menu. and then by adding these measures to our visualizations the report is complete allowing the user to immediately see the results of their inputs. For stochastic modelling you can use a randomization function like RAND() or Poisson.Dist() to determine for instance the probability of achieving a target based on the parameter input. To create the R based visuals on page 2 & 3, you will need an ML Studio based experiment that is deployed and the AzureML and ggplot2 R packages installed. Please note that since the AzureML R package uses networking capabilities it is not yet available in the service, i.e. only works on-premise. 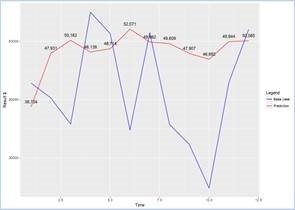 These two visualizations are Power BI R script visuals that uses the R packages AzureML and ggplot2*. The former connects to an MLStudio experiment. For it to do that the scoring experiment needs to be exhaustively defined. In this example we will use the 1) Workspace ID and 2) Experiment name. In addition, the package needs the 3) Authentication information to be allowed to interact with the web service. Copy this information, e.g. to Notepad. And copy one of the tokens to a new row in your Notepad. Copy the entire name, e.g. 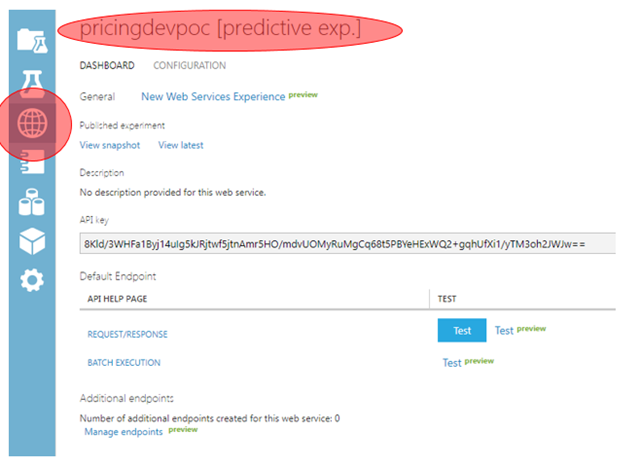 “pricingdevpoc [predictive exp. ]” to your Notepad. Now that you have the required connection information it is time to add the visuals to Power BI. Open a pbix file with the relevant data (typically a subset of the data that you used to train your model on). On the page that you want to add the interactive scoring: insert a simple standard visual, like a table and add the columns that you want to send to MLStudio. Please note that MLStudio requires an exact schema so the column names, sequence and type have to be identical to what the Web service input expects. I would also recommend that you click on the arrow next to each column name in the Values section for the visual and select Don’t summarize, to ensure that it looks correct without any empty rows or text values mixed with numbers etc. wsid = "paste your workspace id here within the quotation marks"
auth = "paste your authentication token here within the quotation marks "
serviceName = "paste your service’s name here within the quotation marks "
After pasting it in the editor, click the Run script play button. If you see an error message, click See details. If the message is “there is no package called…” install the required package, e.g. install.packages("AzureML") from your IDE for R, (RGui, RStudio etc.). Once you have gotten this visual to work you can move on to creating a similar visualization which takes user defined parameters as input. Please see the beginning of this section for information on creating What-If parameters. names(dataset)[names(dataset)=="Product1 Price Value"] <- "P1"
The other difference to the first Rscript are small layout changes. * Third-party programs. This software enables you to obtain software applications from other sources. Those applications are offered and distributed by third parties under their own license terms. Microsoft is not developing, distributing or licensing those applications to you, but instead, as a convenience, enables you to use this software to obtain those applications directly from the application providers. By using the software, you acknowledge and agree that you are obtaining the applications directly from the third-party providers and under separate license terms, and that it is your responsibility to locate, understand and comply with those license terms. Microsoft grants you no license rights for third-party software or applications that is obtained using this software.